Over the weekend we had David's grandparents out for lunch and to also help hook up the generator (yay!). I decided to make pizza because it is easily customizable to different tastes. I don't eat meat or cheese on my pizza, but that's what they prefer. So I made a pepperoni thin crust pizza for them, and I made my "naked" no cheese mushroom pizza for myself. I love to make homemade pizza and have been trying out all sorts of recipes for dough lately. For my naked mushroom pizza, I used this basic dough recipe. I used half white whole wheat flour and let it rise for about an hour and it was perfect. I also like to make my own pizza sauce, and have been using this recipe for quite some time now. It's super easy and very yummy. It also freezes really well, which is handy for future pizza nights (I just freeze it in a mason jar and thaw in the fridge the night before I want to use it). If you've never tried eating pizza without cheese, give it a try! Would you ever consider eating "naked" pizza? Okay now this is my kind of pizza!! Looks awesome. How delicious do those photos look?! Hope you had a terrific time with your family. I like to add caramelised onions to the top of my pizzas when I'm going cheese-free. Sure, but it would have to be the right ingredients! I like "naked" pizzas with arugula and lemon vinegrette! I will have to check out your pizza sauce recipe! I love homeade pizza's! My sister in law is a vegan, so I have had pizza without cheese a few times and it really is surprisingly good. We live in a "cheesy" world, but loaded with veggies, pizza can be just as good without it. When I was vegan I ate lots of no cheese pizzas. Do you have a breaf machine? If so I have a wonderful pizza dough recipe for it. We usually make our own homemade pizzas and have them without cheese. We load them up with roasted veggies, caramelized onion and eggplant. If we have a craving for cheese (which we don't eat) we make a white pizza with tofu ricotta, spinach and garlic. Just recently we made a pizza with leftover meatless meatballs (from a recipe you posted), crushed up and mixed in sauce, it was delicious!! This looks delicious! I love homemade pizza... I almost always have enough dough in the freezer to make one pie. :-) I have eaten pizza without cheese and I like it if there are enough veggies and yummy sauce. The last couple times I have made pizza I've used goat cheese, which is surprisingly good! Hope you have a great week. Wow, that looks great! Yes, I'd totally consider eating a "naked" pizza if it looked as good as yours. I know this will sound like amn amazingly dumb question, but....one can use masion jars for freezing? Yummy, I love pizza! I have never tried making dough for pizza. Maybe someday I will be brave and try it. Thanks for sharing! Have a happy day! Thanks for the response re freezing in mason jars! I would have assumed liquid couldn't be frozen in glass. This is really great to find out! And I might just try that pizza dough! Thanks for this idea, I didn't know it existed. I am starting to cut out cheese in my diet. I don't think I'll miss it as I really didn't eat much of it to begin with. My husband loves cheeseless pizza, it's his favorite type. I also like pizza with just pesto and toppings, it's yummy :) Your pizza looks delicious! I think I could eat it and enjoy it although I have not tried it.. I only like veggie pizza but with cheese.. I need to give this one a try.. Perhaps add a few olives.. smile.. I pretty much like pizza any way I can get it - but I do prefer meatless. Your naked mushroom pizza looks delicious! I've been using that same sauce recipe for a long time too! Tyler makes a good pizza sauce! I have never had a naked pizza, but I think I will try it some night when I am cooking for myself. I doubt Truckin' Man would go for it, but yours looks so good, I have to try it! We just made pizza tonight! I love as many veggies as I can fit on a pizza...tonight I added zucchini with other toppings...delicious! Also we got this garlic spread in olive oil from the olive oil club we belong to...great on pizza. Have a great evening! I love making homemade pizza too -- but ours -- there's nothing naked about it. Lol. this looks yummy!i almost can't type for the drooling over the pictures. naked mushroom homemade pizza. what a treat! I would most definitely consider naked pizza....if you're doing the baking! I kid, I kid. It looks REALLY tasty! I think I'd need to load up on veggies though - my tastebuds are greedy suckers. I love homeade pizza! Economical and fresh, and so much better than delivery! I love a thinner crust so this would be a hit around here, especially with mushrooms! We have been eliminating cheese and dairy these days and I've found with the right flavor combos, we don't miss it! I can't wait for Summer so I can top my crust with fresh tomatoes and herbs! Thanks for the new dough recipes! Yum! I didn't know you could make pizza without cheese! Thanks for the tips, and the link to pizza sauce. I haven't found one I really like yet and have been using organic salsa instead...must try this recipe. I have never considered eating naked pizza but it does sound really good, especially with mushrooms! YUM!! My pizza dough recipe makes enough for two pizza so I usually have dough in the freezer but I never thought about freezing extra sauce too. That would make pizza night really quick and easy! Looks great Tammy. We do eat pizza often around here and I make it all sorts of ways including naked. Fresh from home the way YOU want, SO good and SO awesome. We have pizza Sunday's in the vineyard during spring and summer where I set out an assortment of toppings and let our guest decorate their own before the music man cooks it up. Always a big hit and they love it. Hi Tammy - your pizza sounds delicious - I love mushrooms on a pizza! My Hubby often makes us pizza ~ I like it better than the ordering out kind! I do like cheese on mine though, with carmalized onions and red peppers please! I will keep an eye on your bee keeping progress, and take notes! 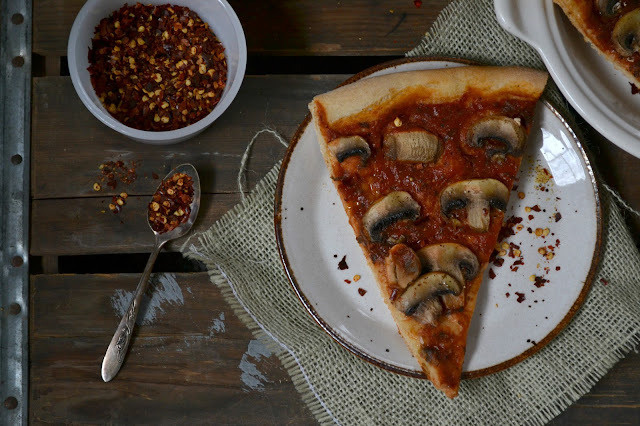 While I like cheesy pizza, I like mushrooms so much that I would definitely eat this naked pizza. In fact, I'm wishing I would have had this for dinner. Stopping by from Hearth & Soul. Your pizza looks wonderful - can almost smell it!! But have to have cheese and onions!! I've never tried a pizza without cheese before, but that actually does look very delicious. This looks SO good! My youngest daughter HATES cheese. I will have to make it this way. Oh my! I have never tried to eat it without cheese, I love cheese! Yours looks really good! Oh, that does look delicious. I love homemade pizza and we eat it a few times a month at least. I'm also trying new crusts and toppings. But we do have our old stand by favorites. I gotta admit I love cheese so don't go naked often, but there are certain toppings that I would let stand alone, fresh morel mushrooms for instance :) If I get any this spring I'll make my pizza like this! Can you believe that I have only ever made my own pizza dough twice? I am so impatient that I can't wait for the dough to rise. I am vowing to try it again this weekend and this is definitely the scrummy recipe that I will be using! I would love some pizza please! It sure looks yummy... even naked! Oh that looks good just like that!